Uglyworld #211 - Hello Lost Kitty, originally uploaded by www.bazpics.com. Yellow Ice-Bat was out in the garden playing this morning (he said he wasn't scared of the wind or rain and that it being so cold was actually ok for him). He came running into the house just before lunchtime screaming for help, everyone automatically thought that he had fallen and hurt himself while playing - but to everyone's surprise the help needed wasn't for Ice-Bat! 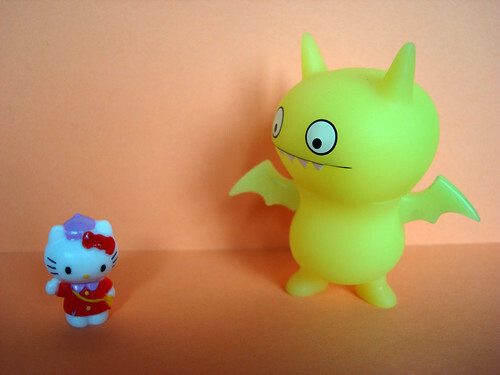 A small kitty had noticed Ice-Bat playing in the garden and decided to ask for his help, it turns out she was completely lost and was trying to find her way to Koln but must have taken a wrong turn along the way. As Ice-Bat had only just arrived in Aachen himself he had no idea where Koln was, or how to help the poor kitty out - so he decided that the best thing to do would be to flap his wings like mad and scream for help.